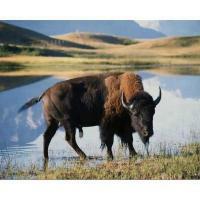 The bison is the largest terrestrial mammal in North America and Europe. Use this printable photo to teach kids about the Bovinae family. Line up this photo with their buffalo brothers in Asia.